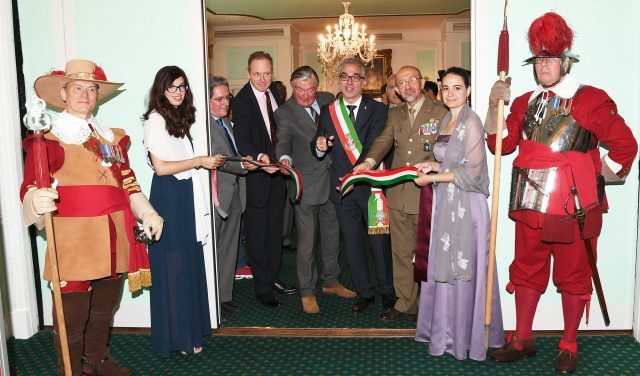 The 1st of August, the Army and Navy Club in London hosted a ceremony to commemorate the 100th anniversary of the Battle Of Vittorio Veneto, the First World War’s last battle between Italy and the Austro-Hungaric Empire. The choice of commemorating the occasion in London is due to the presence of a British brigade alongside Italian troops during that battle; a fundamental help that secured Italy’s victory on the North-Eastern front and led to the conclusion of hostilities and the return to a peaceful living. The ceremony was celebrated with an exhibition, entitled “Storming The Skies: the saga of the Italian front – unconventional aspects of a war”, where the value and courage of Italian soldiers on the Front were commemorated. In particular, Brandolino Brandolini d’Adda was remembered, as the only member of the Chamber of Deputies of the Italian Kingdom, voluntarily enrolled on the Front, who unfortunately lost his life in that Battle. A delegation from the town of Vittorio Veneto, presided by the Mayor Roberto Tonon, officiated the commemoration in London, together with Gen. Fulvio Poli, the Defense Attaché of the Italian Embassy in London Gen. Giovanni Gagliano, and the First Counsellor of the Embassy, Fabrizio Colaceci.